Band-Aids are a staple product for fixing kids’ skinned knees, but they weren’t always around. Before Band-Aids, people tied strips of cotton or muslin to a wound. Before that, people even used natural materials, such as leaves, to dress wounds. So, who invented the first Band-Aid? The story goes that in 1920, Earle E. Dickson, a worker at Johnson & Johnson, invented the Band-Aid because he was tired of dressing his accident-prone wife’s fingers. She often burned or cut herself in the kitchen. At the time, his only option was to cut a piece of gauze and adhere it to the wound with surgical tape. Dickson laid out a piece of surgical tape and laid pieces of gauze on it at intervals. He covered the outside of the surgical tape with a strip of fabric, rolled the tape up, and stored it. He was able to quickly cut off a piece whenever needed and the Band-Aid was born. The first commercial Band-Aids were made available in 1921. Johnson & Johnson continued to make improvements, such as adding holes to the strips so the wound could breathe and packaging the strips individually. 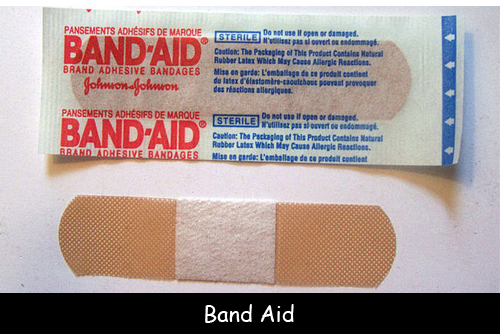 Question: Are Band-Aids used throughout the world? Answer: Interestingly, another company, Smith & Nephew, developed a product called “Elastoplast” in 1924, which was very similar to Band-Aids. This product is still used in England and Australia. Learn more about Band-Aids here.